Double the Fun, Double the Excitement, Double the Splash! The definition of cool ! This Slide is Awesome with a capital A! 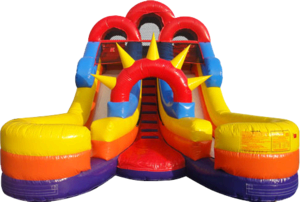 Head through the Spike Entrance, Climb the stairs, choose left or right and race your friends to the bottom for some Serious Splash FUN –Repeat !